The Indian Army was created in 1776 under the Supreme Governance of East India Company at Calcutta, the main function was to sift and record orders related to Army by East India Company. The Charter Act of 1833, the Secretariat of East India Company was revised into four Dept. including a Military Dept. The Army became a single unit on April 1895 when the Presidency Armies united into single Indian Army. To run it smoothly they have divided into 4 Commands at that point namely Punjab (including the North West Frontier), Bengal, Madras (including Burma) and Bombay (including Sind, Quetta and Aden). 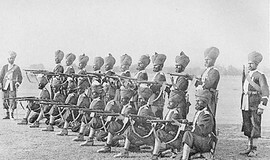 The British Indian Army was a critical force in the primacy of the British Empire in both India, as well as across the world. Besides maintaining the internal security of the British Raj, the Army fought in theaters around the world - Anglo-Burmese Wars, First and Second Anglo-Sikh Wars, First, Second and Third Anglo-Afghan Wars, Opium Wars in China, Abyssinia, Boxer Rebellion in China.